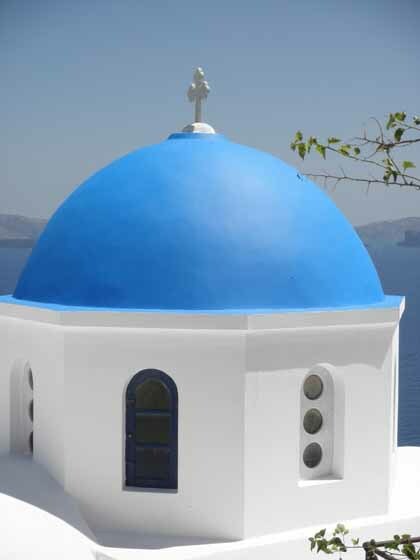 In Anita Finlay’s third and final article about her Mediterranean cruise, she takes us to the enchanting islands of Mykonos and Santorini. The great thing about visiting paradise is the joy of knowing you have realized a dearly held wish. 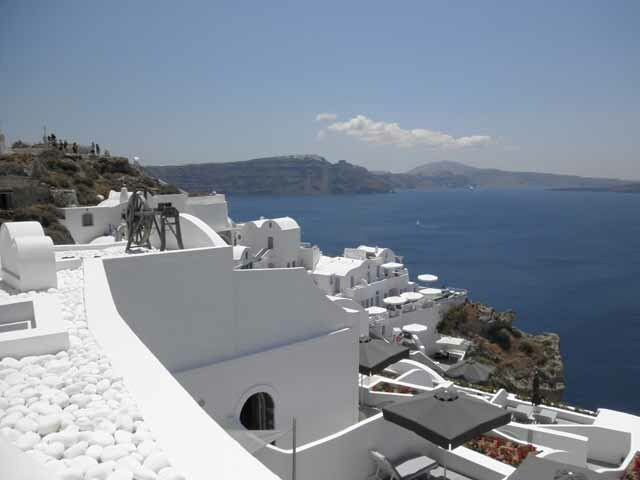 My initial introduction to the stunning islands of Mykonos and Santorini were via a Barnes & Noble wall calendar. 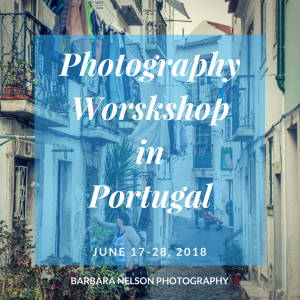 Each year, and for many years, staring at photographs of the Adriatic against the white walls and magical porticos of island homes there was as close as I would get. I had hoped that treating ourselves to a Mediterranean cruise meant my husband and I could finally throw the bookstore calendars away, and make a few of our own. 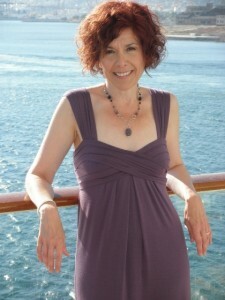 As our cruise ship, the Celebrity Equinox, arrived in the bay of Santorini, I couldn’t get dressed fast enough. The tenders loaded up early that morning to take eager travelers to shore. The ship’s crew, as per usual, was efficient in getting us aboard the boats which held about 120 people and soon we were standing at the tiny dockside area where tourist shops were nestled into the mountainside. We made for the left of the dock before our fellow travelers noticed and were first in line for the cable car that traveled up the side of the mountain into town. Cable cars, like ski lifts, scare the crap out of me. This should tell you just how much I wanted to experience our destination. But our other options were walking up the switchbacks 587 steps or riding up via donkey. Informed that the donkey scent would “stay with us” throughout the day, we figured to spare ourselves the aroma and save our energy for the walking we would do later. And the donkeys made the cable car seem much less frightening. 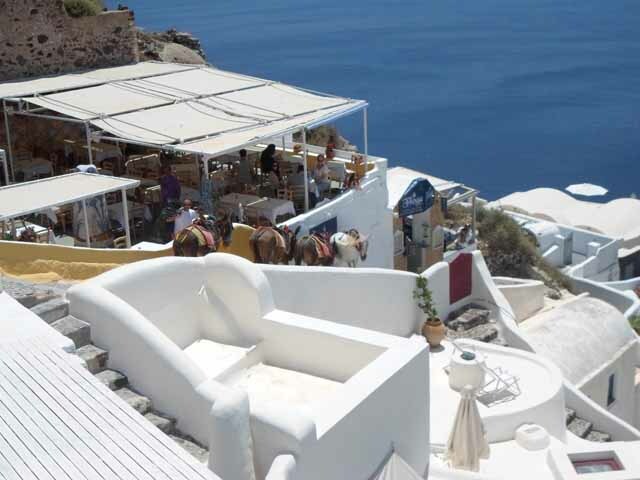 When we first arrived atop the mountain in the village of Fira, we were greeted by friendly, easygoing shopkeepers offering costume jewelry by the basketful — one set of pastel stones prettier than the next. 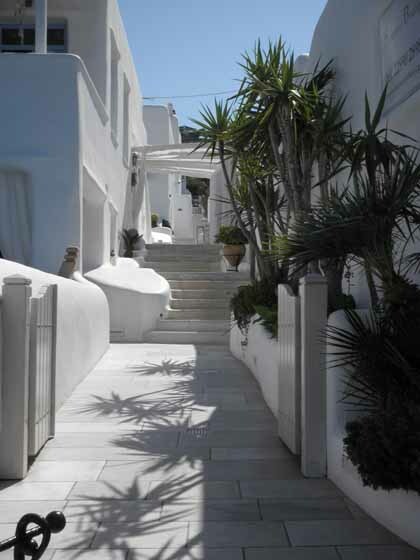 The narrow walkways were charming and picturesque, making the town feel at once intimate but not cramped. We were also lucky that the Equinox was the only ship in port that day so we had the place to ourselves. 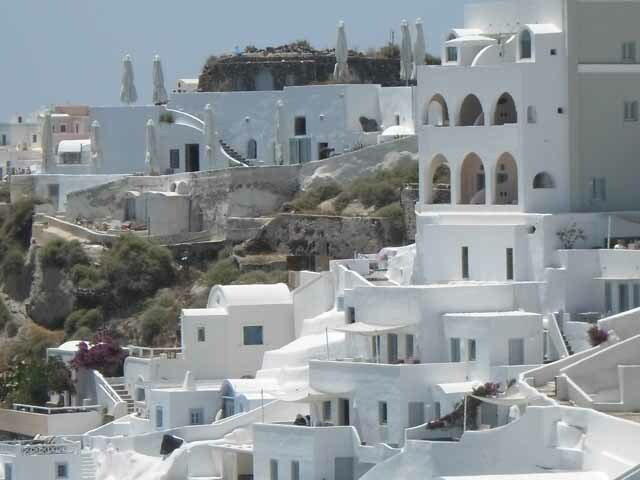 After spending an hour checking out the various clothing, jewelry and art vendors up and down the narrow side streets, we made our way to the town of Oia (Ee-ah), a 15 minute bus ride from Fira. When we got off the bus, we realized where all the Barnes & Noble people had been taking their pictures! 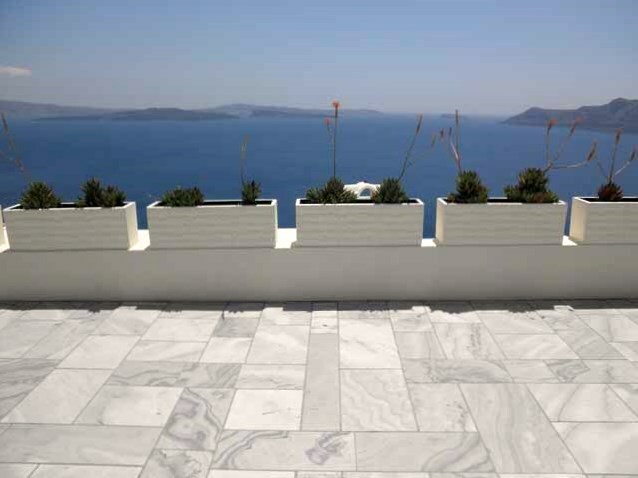 Until you see for yourself that the town’s main thoroughfare is paved in marble, you won’t believe it. Tourism drives both islands, but still, shop owners had such a sweet and welcoming demeanor whether we bought anything or not, our day was all the better for meeting them. We marveled at the local architecture and had lunch at Flora Café, another recommendation from the always reliable Rick Steves in his book, Mediterranean Ports. 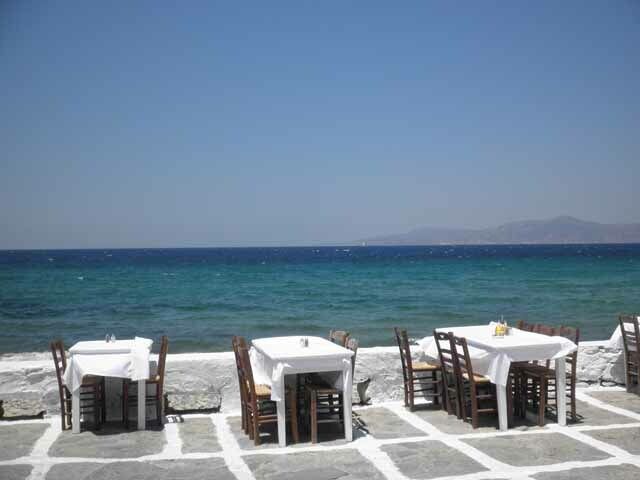 Walking up yet another staircase, we parked ourselves at an outdoor table overlooking the sea. Armir, our brash but charming waiter at the Flora Café, had a way of bossing us around while catering to our every wish. “You must try the Greek pizza,” he said. “After all, you are here!” We took his advice. The crust was unlike anything we had tasted. I can only tell you that you have not had a Greek salad until you have had one in Greece. The Feta was piquant, not salty, and the tomatoes tasted as though they had been picked two minutes ago. We also ordered spinach pie and a mysterious raspberry smoothie concoction. Lunch for three of us was a steal at 28 Euro. Eat there: Delicious, every last bite. And, of course, you cannot beat the view. 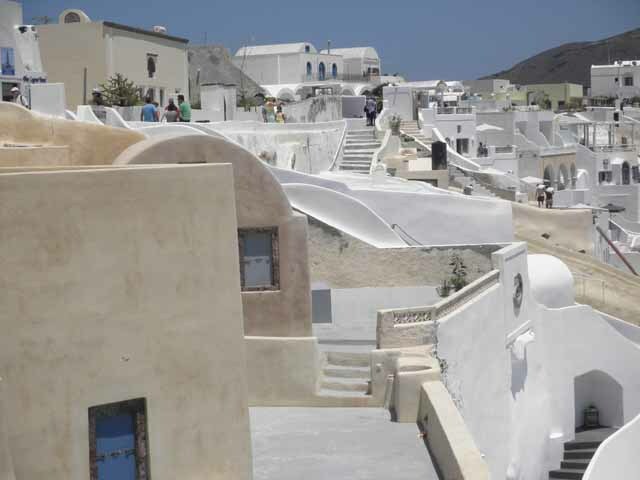 It is impossible to get lost in Oia because most of the day you are following the marble walkway that runs through the center of town. Retracing our steps to head for the bus, however, we took a detour aiming to get as close as possible to the water. As we meandered through “streets” below the main drag that were no more than six feet wide, the effect was not unlike being lost in a magical maze. We later stumbled upon what must be considered the Beverly Hills of Santorini, with expensive gold jewelry and fine art shops – but not before spying some of the donkeys we missed on the way up as they headed for home! The churches were likewise a sight to behold. Then, reluctant to leave, we made our way back to the bus. 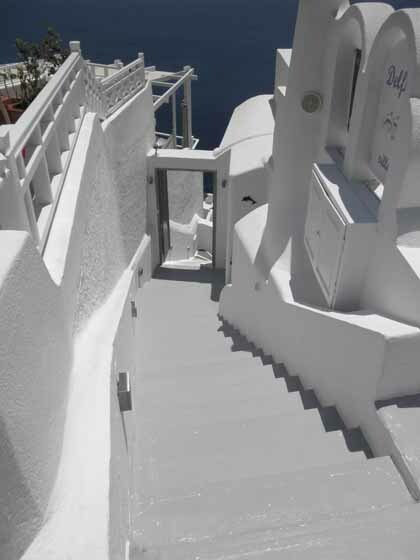 Once in the village of Fira, we made a last pass at some of the shops, drinking in as much of the lovely scenery as we could before boarding the cable car back to the bottom – and our tender back to the ship. 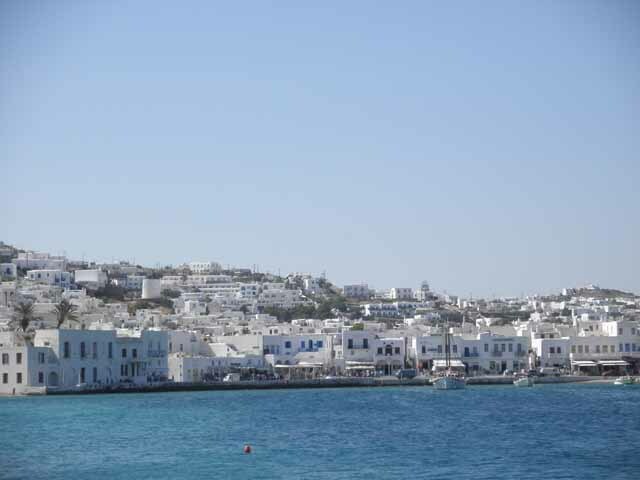 Two days later, we were once again in paradise, this time, in the more rustic town of Mykonos. Once the ship landed in port, it was a five minute shuttle bus around the harbor and a brief walk into town. In keeping with the mode of our trip thus far, even if we didn’t need to scale a mountain to do our sightseeing, we found one to climb anyway! 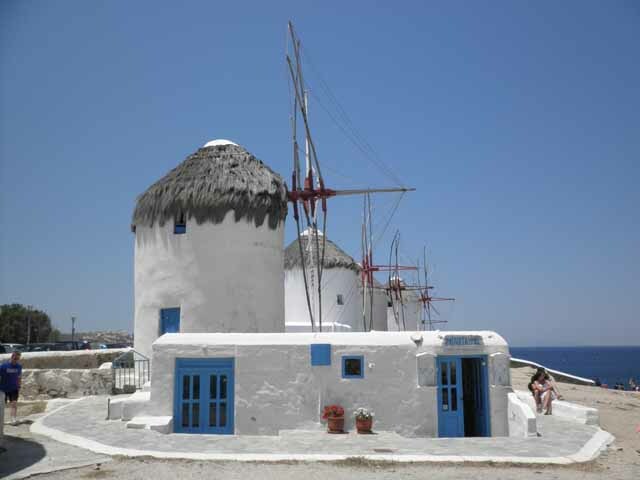 Walking up to a high view point for a photo op, we soon realized that we didn’t need to schlep as far as we had in order to visit the stunning windmills that are a famous part of the island. 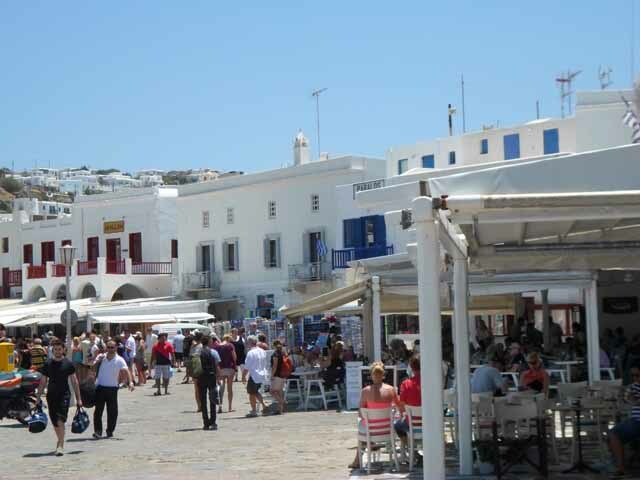 We also discovered that Mykonos is famous for its different winds — in fact the wind we experienced, referred to as “chair-thrower,” was most welcome in the 90 degree plus heat. My advice, ladies: wear a hat or a visor and forget about having a good hair day! 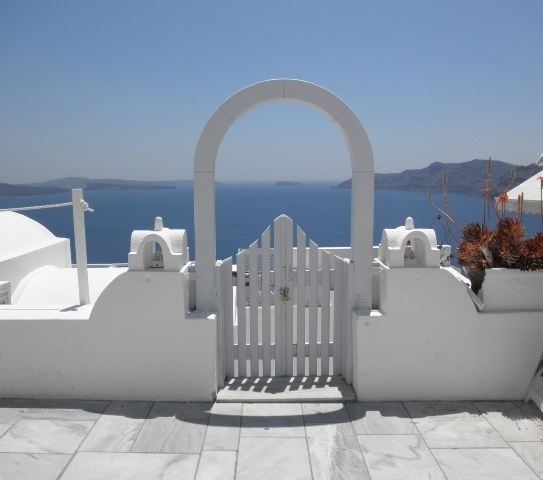 We happened upon a back staircase traversing the cliff side area in which we found ourselves and kept heading downhill, wandering through another maze of lovely homes and narrow stone streets that were little wider than a hall way. We were in no rush to make our way into town, almost hoping to get lost so some kindly residents would take us in and keep us there indefinitely. We were ready to hang out a shingle — will work for Feta! 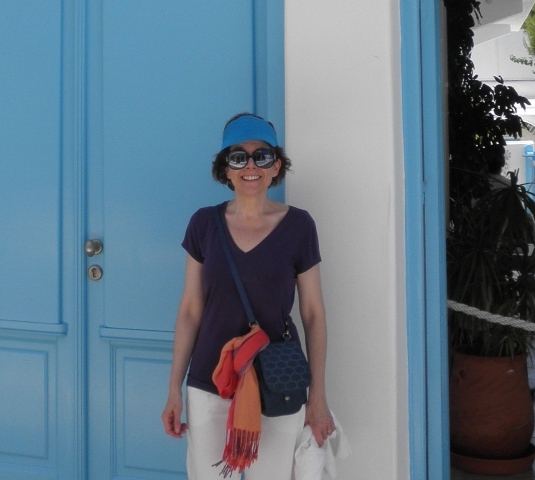 In spite of my husband being a bit hobbled by a surprise bout of sciatica, he insisted on exploring every staircase and back alley, having to take a picture of each one. Of course, our fellow tourists were not real happy to be held at bay while he captured the moment without human interruption. By the way, I have a pet peeve about sunglasses and hate wearing them, but was forced to buy a pair, grateful to spend a few Euro to protect my eyes from the glare of the near blinding sunshine on white sidewalks — and white everything else. I don’t know how I managed to choose the largest pair they had, but the gigantic lenses perched in the middle of my smallish face made me look rather like a bee. In town, we found lovely shops carrying inventive artwork and jewelry and were shocked to jump onto a stairway as a rare automobile actually made its way through the narrow street, missing the store owners’ wares by millimeters. We couldn’t resist taking a little of Mykonos home with us. 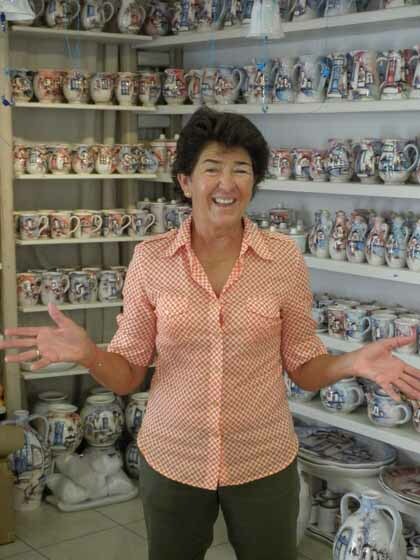 Our favorite was the Hermes Gallery, selling beautifully painted platters, bottles and urns made by a local artist. Owners Nikolas and Sandra nearly adopted us, and recommended a fabulous place for lunch, The Alegro Café, just a few blocks from their shop along the harbor. And this was the view from our table. 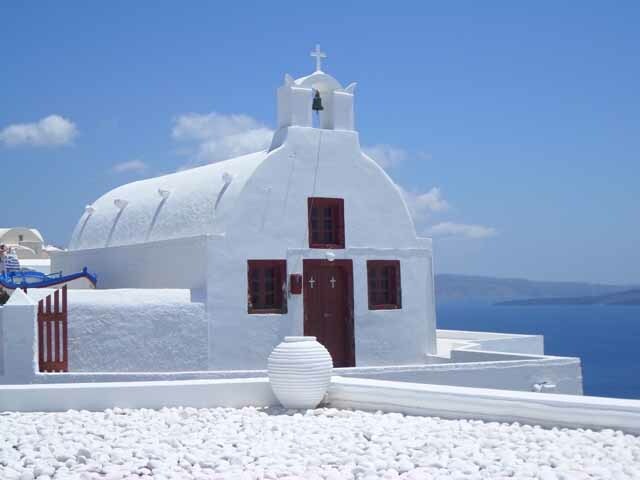 By far, Mykonos and Santorini were the favorite ports of our cruise. 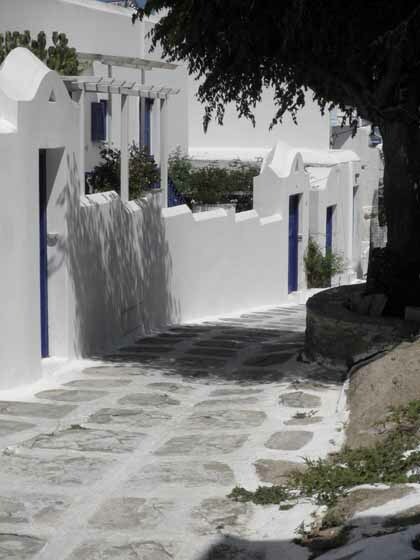 The serene, relaxed quality of the islands, the kindness and warmth of the people, and the rustic atmosphere of Mykonos in particular, made clear these were venues we would be content to spend weeks in, not just hours. Which brings me to the only tough part about visiting paradise — your stay will never be long enough. This article was originally published on Traveling with Sweeney.